But we can look at the previous times the Dow burst through a record, and measure how long it kept rising and why it eventually stopped — ending the bull market — what does history show? After it broke one record, the Dow kept rising for nearly nine years. After another, it rose for seven years, and after another, for five. But after one, it topped out just two months later. In most cases, the bull run ended because inflation and interest rates were rising and investors feared a recession loomed. Those conditions don’t exist today. The Dow closed at 14,253.77 on March 5, 2013 — beating its October 2007 record by 89 points. So far, its highest close ever was Thursday March 14, 2013 — when it reached 14,539.14. Here are previous long-held Dow records since World War II, when they were broken and what happened afterwards. — RECORD DAY: November 23, 1954 — The Dow breaks the record that had stood since September 1929, closing at 382.74. — RISE CONTINUES: It keeps rising for seven years, gains 92 percent and peaks at 734.91 on December 13, 1961. The Dow’s record-breaking day in 1954 was a long time coming. It had been 25 years since the index hit 381.17 on September 3, 1929, when the Roaring Twenties were still roaring. The Dow plunged in the Great Depression and bottomed at 41.22 in 1932 — down an astonishing 89 percent from the 1929 peak. For the rest of the 1930s, it never came close to regaining all its losses. The highest it reached was 194.40 in 1937 — still down nearly 50 percent from the 1929 Crash high. During World War II, from 1941 to 1945, the Dow rose to 174. Peacetime spurred it even higher, helped by a “Baby Boom” and a desire to spend after years of rationing. The U.S. became the world’s powerhouse economy because the economies of Europe and Japan were wrecked by the war. After a late ‘40s bear, the Dow went on a bull market run that lasted from 1949 to 1961, its longest ever. By June 26, 1962 the index had fallen 27 percent from the previous year’s record, to 535.76. — RECORD BREAKER: September 5, 1963 — The Dow breaks the record that had stood since 1961, closing at 737.98. — RISE CONTINUES: It keeps rising for almost two and a half years, gains 35 percent and peaks at 995.15 on February 9, 1966. The Dow bounced back from its so-called “Kennedy Crash,” and on September 5, 1963 it set a new all-time high, up 38 percent from its low in June 1962. President Kennedy had taken pains to reach out to businesses and promised lower taxes. The standoff with the Soviet Union in October 1962, a fight that came to be known as the Cuban Missile Crisis, ended without war which gave the market license to rise again. On February 9, 1966, the Dow hit 995.15 and stopped rising. Investors went from planning Dow 1,000 celebrations to worrying that inflation was about to creep up and that the Vietnam War would drag on. After the February 1966 record, the Dow fell 37 percent over about four years. It bottomed out on May 26, 1970, in the middle of a recession, at 631.16. — RECORD BREAKER: November 10, 1972 — The Dow breaks the record that had stood since 1966, closing at 995.26. — RISE CONTINUES: It keeps rising for two months, gains 6 percent and peaks at 1,051.70 on January 11, 1973. A new bull market began in May 1970, and the Dow rose 58 percent in two and a half years. By late 1972, cease-fire talks were under way for Vietnam, and investors were hopeful that the U.S. would soon pull out. Inflation had cooled to about 3 percent. Richard Nixon had just been re-elected in a landslide a few days before, beating George McGovern in every state but Massachusetts as well as D.C. The New York Times captured the gleeful mood as the market approached its next goal post. “Tapewatchers Around the Nation,” the newspaper wrote, describing the November 10, 1972 record day, “rooted with the zest of football fans” — Four days later, the index closed above 1,000 for the first time. But the celebrations were short-lived. 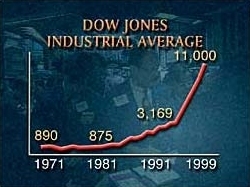 The Dow topped out two months later, on January 11, 1973 at 1,051.70. The crisis in Vietnam continued, inflation took off again, and oil prices soared that fall, triggered by an embargo against the U.S.
By December 6, 1974 the country was stuck in recession and the Dow was down to 577.60, 45 percent below the record it had set the year before. — RECORD BREAKER: November 3, 1982 — The Dow breaks the record held since 1973, closing at 1,065.49. — RISE CONTINUES: It keeps rising for almost five years, gains 156 percent and peaks at 2,722.42 on August 25, 1987. In August 1982, another bull market began. By November of that year, the Dow finally beat the 1973 record. Reagan’s tax cuts were taking effect. Over the next five years, unemployment and inflation fell, and the economy grew rapidly. Baby boomers were buying homes, raising kids and spending. In 1987, the Dow had 55 record-breaking days. Its last was August 25, when it peaked at 2,722.42. Things unraveled quickly after that. On October 19, 1987 — investors panicked over whether the recent stock gains were just a bubble and the Dow plunged 23 percent to 1,738.74. The fall was so abysmal that it remains the index’s biggest one-day percentage loss ever. By the end of Black Monday, as it came to be known, the Dow was down 36 percent from the record it had set just two months before. — RECORD BREAKER: August 24, 1989 — The Dow breaks the record held since 1987, closing at 2,734.64. — RISE CONTINUES: It keeps rising for almost a year, gains 10 percent and peaks at 2,999.75 on July 16, 1990. The Dow recovered quickly from its Black Monday in 1987. The Federal Reserve reassured investors by immediately cutting interest rates, a move meant to spur borrowing and lending, and declaring that it was ready “to support the economic and financial system” — Reagan insisted the economy was fundamentally sound. Soon enough, investors began to think of the one-day panic as a sign of scared stock traders and unwieldy computer trading, rather than an indictment of the broader economy. Through 1988 and 1989, the economy kept expanding and unemployment stayed low. On August 24, 1989 — the Dow was up 57 percent from its Black Monday disaster and broke its August 1987 record. It kept rising for almost a year. In the summer of 1990, it came agonizingly close to a 3,000 close, ending at 2,999.75 on both July 16 and July 17 — On the second day, traders at the New York Stock Exchange tossed paper in the air in celebration at the end of the day— then realized, when the final figures were tallied, that the celebration was premature. That same day, Saddam Hussein warned that Iraq would retaliate against other oil-exporting countries unless they curbed their production. Two weeks later, Iraq invaded Kuwait and oil prices surged. As the Gulf War ramped up, the Dow entered a brief bear market from July to October 1990, falling 21 percent. — RECORD BREAKER: April 17, 1991 — The Dow breaks the record held since 1990, closing at 3,004.46. — RISE CONTINUES: It keeps rising for almost nine years, gains 290 percent and peaks at 11,722.98 on Jan. 14, 2000. In October 1990, a new bull run began, one that would last through 2000. Its length was second only to the bull market that spanned the 1950s. An early milestone of this bull run happened on April 17, 1991: The Dow reached 3,004.46, passing its July 1990 high and posting its first close above 3,000. The index was up 27 percent from its October 1990 low during the Gulf War. New technology like email, cell phones and, especially, personal computers, fueled a new era in workplace productivity. The Soviet Union dissolved in 1991, an encouragement to American investors. The Dow took off, and when there were unsettling developments in other parts of the world, like the Asian Financial Crisis in 1997 and crises in Russia and Brazil the following year, it kept rising anyway. The index cracked the 10,000 milestone in March 1999, and 11,000 barely a month later. On January 13, 2000 President Bill Clinton visited the New York Stock Exchange and told traders that he liked the way the market was looking. The next day, the Dow hit another record, 11,722.98. The Dow started to fall the next trading day, the bubble made by technology stocks soon burst — known as the Dot-Com Crash, the 9/11 terrorist attacks, uncertainty about the wars that would follow and accounting scandals at companies like Enron, WorldCom and Tyco left investors shell-shocked. By October 9, 2002, the Dow had fallen to 7,286.27, down 38 percent from the 2000 record. — RECORD BREAKER: October 3, 2006 — The Dow breaks the record held since 2000, closing at 11,727.34. — RISE CONTINUES: It keeps rising for another year, gains 21 percent and peaks at 14,164.53 on Oct. 9, 2007. In October 2002, the Dow started another bull run. The market had gotten over the tech bubble bursting and was being fueled by an over-expansion of another sort, in the housing market. Low interest rates and easy access to credit enticed borrowers to buy homes they couldn’t afford. Banks and other lenders repackaged the mortgage loans into securities and dumped them on investors, freeing themselves up to make even more loans. Speculative buyers also helped push home prices un-sustainably higher. On Oct. 3, 2006, the Dow broke its 2000 record and closed at 11,727.34, up 61 percent from its October 2002 low. It kept rising for another year, finally hitting 14,164.53 on Oct. 9, 2007. But by then, hints of the financial crisis were emerging. The Fed was already cutting interest rates, a sign that it was worried about the economy. Home prices were cooling. Sub-prime mortgage giant New Century had collapsed that spring. Citigroup CEO Chuck Prince was a month away from losing his job. By fall 2008, the financial crisis was obvious. Wachovia, Washington Mutual, Bear Stearns and Merrill Lynch were pushed into rescue mergers with other banks, Lehman Brothers collapsed, and mortgage lenders Fannie Mae and Freddie Mac were basically taken over by the government. The panic deepened on March 9, 2009, as rumors flew that the banking industry would be seized by the government, the Dow fell to 6,547.05, down 54 percent from its 2007 record. — RECORD BREAKER: March 5, 2013 — The Dow breaks the record held since 2007, closing at 14,253.77. The Dow’s record doesn’t necessarily mean that investors believe the economy is fully healed. Rather, they’re confident that the Federal Reserve is willing to keep pumping money into it. They’ve learned to ignore budget fights in Washington. It’s impossible to predict how long the bull run could continue but so far, there aren’t all the tell-tale signs that it’s about to run out.